As discussed in the first part of this article series, modeling contracts aren’t one-size-fits-all. Every agency has a unique way of doing things, and each one will have its own rules, regulations, and guidelines. 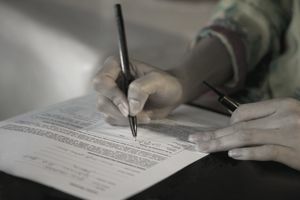 The more contracts you sign, the more you’ll get to know their similarities and differences, but until you reach that point you’re bound to feel a bit lost. It might help to know that there are generally four primary types of modeling contracts in the industry: mother agency contracts, nonexclusive contracts, exclusive contracts, and one-time-only contracts. A mother agency (or mother agent) is the one you first begin working with. They’re the agency that helps you learn the industry and build your portfolio, and that gives you the guidance you need to succeed as a model. Therefore, a mother agency contract will most likely be the first one you’ll ever sign. Mother agencies are often smaller, local modeling agencies. To help their models book more lucrative and book important jobs, the mother agency will often promote its models to other agencies in larger markets, such as New York, Paris, Milan, and Tokyo. Being in a larger market means you’ll have the chance to book modeling jobs with major publications like Vogue, Elle, and W, and work with major clients like Gucci, Prada, and Abercrombie & Fitch. Your mother agency will receive a commission, generally between 5 percent to 10 percent, from what the larger agency deducts. Since the mother agency is getting a percentage of what the larger agency is deducting anyway, it will not cost you more to have both a mother agency and larger agency representing you. Having said that, there are some markets, particularly in Asia, in which the mother agency commission is taken on top of the larger agency commission. With mother agency contracts, it’s important to note how long the contract is binding. Some contracts only last a year or two, but others can last the duration of your entire career. A nonexclusive contract gives models the power to sign with as many agencies as they want and possibly find their own non-agency side jobs. This is more common for commercial models than the high fashion or editorial models. You might not get as many opportunities or as much guidance with an nonexclusive agency as you would with an exclusive one, but this type of contract does offer models a lot of freedom. If the modeling agency finds you work then they get paid a commission. And if you find work on your own, you owe them nothing. When you sign an exclusive contract with a modeling agency, you can only be represented by that agency for the duration of the contract. Sometimes there are exceptions—the term “exclusive” may be limited by time, geography, or type of modeling—but if you’re working with a top agency like Ford or Wilhelmina Models, then it means you can't sign with anyone else without their permission. This type of contract gives a lot of power to the modeling agency, so if you’re considering signing an exclusive contract it’s even more important to make sure you’re working with a reputable modeling agency that has your best interests at heart. This type of contract is only good for a single booking. As soon as the project is complete, the contract ends. Be sure that all the details—such as the amount you'll be paid, how your photos are going to be used, how long they'll be used, and restrictions for working with competing companies—are clearly explained in the contract. It's always advisable to work with an agency that can help you with this sort of contract rather than signing one on your own. This is part two of a two-part article series: "Part 1 of How to Understand Modeling Contracts" .